Over the last number of years modern shows have given buyers an excellent opportunity to source the finest interior pieces from the golden age of design by staging a series of one day furniture fairs. These shows are not just an excuse to visit amazing host buildings but to see them furnished with mid century gems alongside the work of up and coming contemporary designers. The next show on their agenda is the Mid Century Modern show at Dulwich College, South London on Sunday November 18th 2018. This fair is a biannual event and is held in the brutalist Christison Hall, a light and airy mid century building created in the 1960’s from concrete and brick. This apt setting will play host to 85 sellers made up of dealers of furniture and interior products from the modernist era and 25 contemporary designers. These designers will be showcasing products ranging from ceramics, to wallpaper and from cushions to furniture and I am very happy to announce that I will be included among them. This show is an exciting opportunity as it allows me to bring my work to a new audience and also affords me the opportunity to showcase the new pieces I have been working on this year. 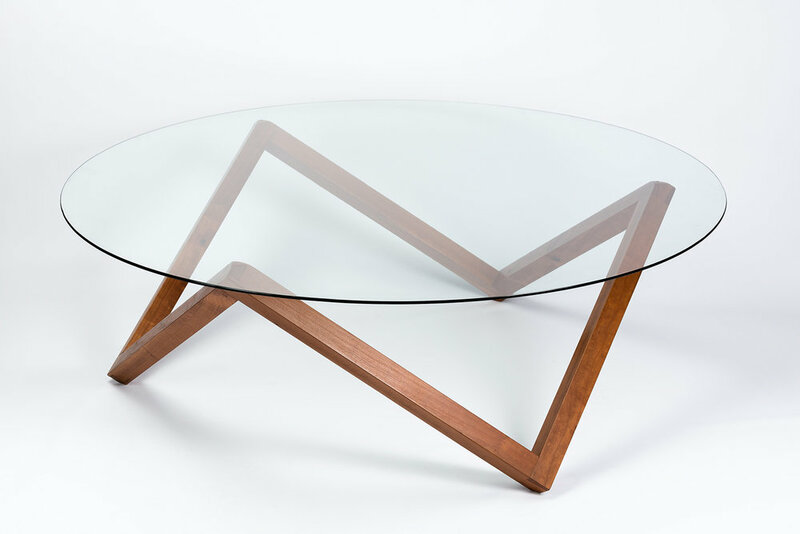 The prism coffee table pictured below is one of the pieces that will be on display at the fair and this has been a popular piece with clients during the year with variations having been made to order in a range of sizes and in a selection of species including Walnut, Cherry (as shown), Wenge and Ash. Other pieces to be showcased on the day include, the Amplex Chair in ebonized Oak and grey Leather (shown at bottom), a Fleure side Table in European Oak, an Eala lamp and a Fleure Coffee Table in English Ash. The fair is open from 10 am until 4 pm and tickets cost £10 with pre-show discounts available from the show website. For further details or to purchase tickets please click on the show poster image above. If you decide to attend please come by to say Hi.